Jérôme René Alexandre Marie Gratry died July 30th surrounded by close family members. Born in October 1942 in Mâcon, France to Charles and Agnes Gratry, Jérôme was educated in England, Switzerland and France before moving to the United States to attend Lake Forest College in Lake Forest, Illinois. He then earned an MBA at Thunderbird School of Global Management. As a young research analyst at Morgan Guaranty in New York, he met Barbara Bolton, whom he married at St. Hubert's Church in Kirtland Hills, Ohio in 1972. Jérôme worked 13 years at Morgan, including seven years overseas in Paris, France, and Geneva, Switzerland, before returning to New York City. Jérôme and Barbara welcomed four children between 1973 and 1983, two boys and two girls. In 1981, Jérôme and his family moved to Cleveland, Ohio, where he established Gratry and Company, a global investment firm. 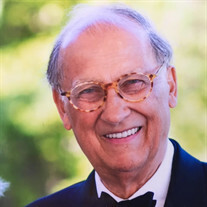 He was a founder of the Chagrin River Land Conservancy, served as a trustee for many years and was instrumental in preserving land in Hunting Valley; he also served on the boards of the Cleveland Orchestra and the Children's Aid Society. A voracious reader of history, philosophy and religion, Jérôme was a deep thinker whose gentle wisdom encouraged others never to stop asking why. With a wry sense of humor and twinkle in his eye, Jérôme never fully lost his French accent; he enjoyed French red wine and cheese, and had honey with his breakfast every morning for over 50 years. He loved Prouts Neck, Maine, where his family spends summers, and where he perfected his tennis stroke and the art of cooking and eating lobster. Nothing was more important to Jérôme than his family. He is survived by his wife of 45 years, Barbara; his children, Oliver Gratry and wife Lindsay of Mill Valley, California; Adrienne Schoetz and husband David of Wilton, Connecticut; Julian Gratry and fiancée Jamie Tisch of New York, New York; and Beatrice de Rougé and husband Aymeric of London, England; as well as seven grandchildren; a sister Christine Burrus-Paquet, two half-brothers Mathias Gratry and Boris Gratry, all of Geneva, Switzerland. The family suggests memorials be sent to: Hospice of the Western Reserve at 17876 St Clair Avenue, Cleveland, Ohio 44110. A Memorial Service is being held at home on Saturday, September 9 at 12 Noon for family and close friends.